Dmitry Tursunov captured the Open de Moselle title on Sunday with a three-set victory over French crowd favorite Paul-Henri Mathieu. 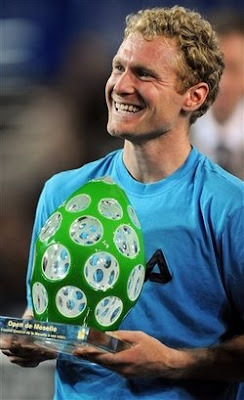 The fifth-seeded Tursunov notched a 7-6 (8-6), 1-6, 6-4 triumph for his fifth career title and second of 2008. He also won in Sydney at the start of the season, and Sunday's win improved his career finals record to 5-2. One of those losses came in July at Indianapolis. Mathieu, seeded fourth, was playing in his first final of the year and the seventh of his career. He fell to 4-3 in title matches, last winning a tournament last year in Gstaad. The victory was worth $82,000 for Tursunov, who was born in Moscow and resides in California. He improved to 2-0 lifetime against Mathieu, also winning a three-set match at the Queen's Club in 2007. Frenchmen Arnaud Clement and Michael Llodra retained their Open de Moselle title after defeating top seeded Poles Mariusz Fyrstenberg and Marcin Matkowski 5-7, 6-3, 10-8 in a repeat of the 2007 final.